Whenever Orsen Well’s classic Citizen Kane comes up, who doesn’t mournfully moan “Rosebud”? Okay, maybe it’s just me. But, for those of you who like classical movie AND bar trivia in one shot, apparently Mr Kane’s little red sled is the inspiration for the name of the Rosebud bar. This little watering hold has been attracting the city’s literati and deep thinkers (Sartre was a regular) since the 50’s. The decor probably hasn’t changed a great deal since then, either. The front of this Montparnasse bar/restaurant is pretty unassuming, so I was pleasantly surprised to walk in and find such a charming and warm little spot with its comforting 30’s vibe and white jacket clad barmen. The bar stools are packed like sardines along the counter, but there are plenty of tables and chairs for those who might want a bit more space (or to sample something off their dinner menu). We sat at the bar and reviewed the cocktail menu, which offered a martini, so I was set. Matt ordered a daiquiri. The barman handled both drinks well, chilling my glass, stirring up a nice proportion of Beefeater & NP and topping it off with a twist. Matt’s daiquiri was a well done classic and not the overly sweet & crazy fruit concoction that this drink sometimes inspires. 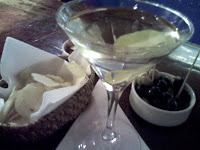 Typical (but nice) bar snacks of olives, chips and crackers followed our drinks. Matt was driving and I was pressed for time, so unusually, we didn’t do a second round. I did, however, note they offered sidecars on the menu, which I mention because a few folks have been asking about where to get them lately. During our hour or so there, a handful of people wandered in and out who seemed to be on friendly terms with the bar staff, so I assume this place has a nice little following of regulars. Overall, I enjoyed this as a historical little stop for a tipple. Matt felt like the drinks at 12 Euros were a little higher than he would have expected walking into such a quiet and unassuming place. However, considering its long standing history and decent preparation, I believe they’re on the mark. I’ve been on the hunt for places in this area, so if I were going out to dinner in the neighborhood, I’d gladly stop at the Rosebud again for a pre-dinner cocktail. It’s not just you. And you’ve got to do it with that quiet, hoarse moan, right? i love Sidecars, the afterdinner equivalent of the predinner White lady, which is my favourite cocktail. Me, too…I’m a big fan of sidecars. I will definitely start keeping an eye out for good sidecar spots in my cocktail trails, as I’ve had a lot of people asking me about them lately. Do you have a favorite place for them? i actually never had one in Paris (first time i had one was in New York), but i have one at home occasionally as a night cap. next time i go for cocktails, i will look out for them. my standard cocktail when the menu is small and unimaginative is a White Lady. i don’t know why but this particular cocktail turns on the cheerfulness in me like no other drink! if you go to London again (at some point you asked for suggestions), two places you might try out are the St Martin’s (even the ice of the cocktail were interesting) and the Aldwich one. Both hotel bars with really good cocktails and a nice design. Thanks for the tips, Columbine. When and if I get back there anytime soon, I'll keep them in mind. When I was there I checked out a couple of places including Milk & Honey and Montgomery Place. I think I had the best Martinez ever at Montgomery Place & would recommend both of those bars if you're over there.